Find your nearest KLOTZ Sales Office or selected KLOTZ Sales Agents here. 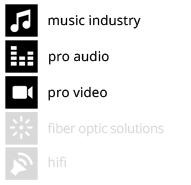 The five icons show each sales agent’s main product focus at a glance. You can also contact our German headquarters with enquiries at any time. Sales Office Klotz Cables Pte. Ltd.
Hi-Tech Audio Systems Pvt. Ltd.
Ghin Gar Cherry Trading & Co. Ltd.
Petchsiam Sound Group Corporation Ltd.
ONE Systems Global Co., Ltd.
3rd Floor, 14 Tran Binh Trong Str. Hoang Tung Pro Sound & Lighting Co., Ltd.